Portable pots of lemon balm and Greek oregano are surrounded by easy to grow Swiss chard in the inexpensive unheated, homemade greenhouse. Gardeners are gamblers. Every year we scatter seeds, stock up on seedlings, amend our soil, water faithfully, cross our green thumbs, close our eyes, and pray for something out there to survive—all the while knowing that Mother Nature has totally stacked the cards against us. Why? Because we've tasted that delicious homegrown pay out, and we crave more. And besides, even if we lose everything this year, we know there's always a chance we can win it all back, and then some, next season. There are no sure things when it comes to coaxing food out of the garden, but just like at casinos and the horse races, some bets have better odds than others. And after 18 years of growing everything from arugula to zucchini in my large organic kitchen garden, I've figured out how to consistently walk away with the biggest payouts: by planting herbs. Homegrown herbs are easy to grow, cheap to keep, don't require lots of space or attention, and aren't usually bothered by diseases and pests, making them perfect for the organic garden. They're pretty to look at, bursting with flavor, and far fresher than anything you can buy at the store. In comparison, store bought fresh herbs are notoriously pricey, often come packaged in non-recyclable plastic containers, and are sometimes sprayed with really scary chemicals. The selection is limited, and a lot of times the fresh herbs aren't actually all that fresh. One of the nicest things about growing your own culinary herbs is that, unlike many vegetables, you don't need a whole bushel to make a worthwhile harvest; just a little bit will go a long way. And most herb plants actually benefit from from being regularly snipped back, even when young. All you really need to get growing is a mostly sunny spot that has well-drained soil. Lots of herbs will also do well in containers, and many can even be grown indoors on a sunny windowsill. Last year I brought three pots of rosemary into the kitchen for the winter and still haven't brought them back outside. Ready to risk it? Here are my six favorite, easiest to grow herbs. If I could only have one perennial herb in my kitchen garden, I would definitely choose chives. They'll endure hot, dry, humid summers with nary a droop and are hardy to Zone 3. Pests ignore them, and they're even said to discourage harmful insects, including aphids and mites, from attacking nearby plants. Chives have hundreds of uses. Show them off in these Savory Chive and Sharp Cheddar Scones, or add them to everything from mashed potatoes and scrambled eggs to chicken salad and quesadillas. Chives also mingle well with other herbs; try mixing some chopped fresh chives, basil, oregano, and parsley into yogurt cheese for a quick, scrumptious, versatile dip/spread (recipe here). Before your plants die back in winter, stash a cup or two of chopped chives in an airtight container in the freezer. The pieces will freeze individually, enabling you to pull out a pinch of two whenever you need it. You can read more about growing chives here. Basil is an excellent companion plant for tomatoes, peppers, and eggplant. Gardening can be a real challenge here in Missouri, and basil is one of my few never fail crops. A few years ago I fell in love with purple basil. If you're a big pesto fan, you can save a small fortune by growing this heat-loving annual. Each summer I stock my freezer with enough pesto to last throughout the year. One of my most popular recipes is this Savory Tomato Pesto Pie with an Easy, Cheesy Foolproof Biscuit Crust. Basil just keeps on giving; with water and sun, these plants will start growing right back. There are two main things to remember about basil: it hates the cold, and it loves to be trimmed back. Start pinching off leaves as soon as the plants are just a few inches high, and continue throughout the season. In early spring and fall, drape floating row cover or an old bed sheet over your plants to protect them from the cold. You'll find all my basil growing posts here. Prepping freshly picked oregano for Slow Roasted Greek Style Leg of Lamb with Lemon, Oregano, Potatoes, and Swiss Chard. When you buy fresh or dried herbs, you often pay for a lot of stems. What goes beautifully with basil? Oregano! Greek oregano is one of the most reliable, low maintenance edible plants in my garden. I've had the same pot of Greek oregano growing for a decade, and all I ever do is water it, eat it, and fertilize it twice a year with sheep manure. I use it in everything from Greek style Panzanella salad and fresh tomato pizza sauce to slow-cooked Greek style leg of lamb and my easy homemade Italian sausage. You can read more about growing perennial herbs in pots here. There are several varieties of thyme, but the one I love the most—and have the best luck growing—is lemon thyme. This low growing, spreading perennial adds a gourmet touch to any dish and can be used whenever a recipe calls for lemon and thyme. One of my favorite ways to enjoy it is with roasted turnips. Try stuffing a chicken with lemon thyme and lemon wedges, or add it to a garlicky marinade for chicken, fish, lamb, or beef. Toss it with tomatoes, stir it into cream cheese dip or herb butter, or add it to a vinaigrette. Make lemon thyme-infused olive oil and drizzle it over mashed potatoes or crisp baby greens. Companion planting in the garden back in the spring: parsley seedlings on one side, chives on the other, with sweet peppers and basil in between. Parsley may be ubiquitous and cheap, but growing your own is still worthwhile, even if you don't live 40 miles from the nearest place to buy it (where it's usually wilted). Organic parsley can be hard to find, and the conventionally grown stuff may have been sprayed with AZM, a neurotoxic insecticide that attacks the human brain and nervous system and is so harmful that it was banned by the EPA last month. What's nice is that you can harvest just what you need, rather than buying an entire bunch and then letting half of it turn to forgotten black mush in the fridge. Last April I bought a six-pack of Italian flat leaf parsley seedlings at a local nursery for $2.50, planted them along one edge of a 4'x8' raised garden bed, and have been snipping fresh bounty several times a week ever since. If you're feeling adventurous, there are several interesting types of parsley seeds available. Learn the best way to store fresh parsley here. Lemon balm is a beautiful, fragrant member of the mint family that is heat tolerant, cold tolerant, rarely bothered by pests, and, like other types of mint, grows like a weed. This gentle medicinal herb has been used for centuries to treat everything from depression and upset stomachs to insect bites, fever blisters, and tension headaches. Sip lemon balm tea throughout the day to aid digestion and alleviate stress and anxiety, either hot with honey or over ice. During the summer I like to stuff a bunch of fresh leaves in a half gallon glass canning jar (I use these jars for all sorts of things), stick it in the sun for a few hours, and chill it in the fridge for a refreshing, healthy drink. 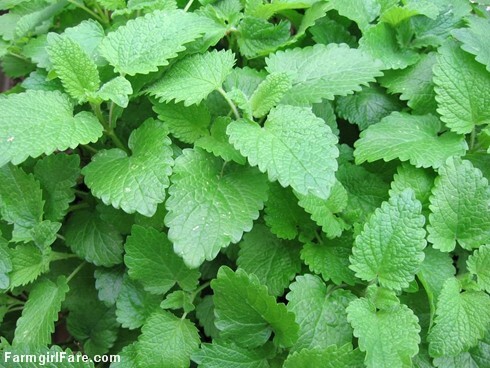 You can read more about growing, drying, and using lemon balm here. Growing your own anything is truly rewarding, and not just because it's the ultimate way to go green. And since young herb seedlings can often be purchased for less than those little 'fresh' packets at the supermarket, even if you end up killing all your plants, you'll most likely have gotten more than your money's worth out of them first. Besides, if you lose it all, you always can go back next season and try to win big again. © FarmgirlFare.com, the fresh flavored foodie farm blog where Farmgirl Susan shares recipes, stories, and photos from her crazy country life on 240 remote Missouri acres. We are going to try to grow some herbs inside this winter. (Guess we'd better get moving on that!) It took me a while to get used to having a small herb patch outside, but now my first thought when cooking is whether I can harvest any herbs for whatever I'm making. BTW, I made both your lemon rosemary zucchini bread AND the coconut zucchini bread. They are both delicious! I, like you am a lover of herbs. I grow rosemary, basil, Thai basil, thyme and mint year round on my kitchen windowsil. Every once in a while I just run my hand through them to dispell their wonderful smells. They are so easy to grow and add so much more flavor to your food. i love herbs too. WE have been eating basil pesto all summer. I love to add mint to lemonade and rosemary and thyme to chicken. So what do you do during the winter? do your herbs die? I remember in my last house that my oregano, thyme and rosemary looked kind of dead in the winter but they thrived and came back in the Spring. But what about the mint and basil? Can they survive frost and snow?